The Federation Council is the primary elected body of the United Federation of Planets and was created in 2161. The primary responsibility of those serving on the Federation Council is to maintain interplanetary peace and security. The Federation President is chosen from the Council membership and oversees the entire Federation government. Established with the signing of the Federation Charter, the Federation Council is the primary legislative body of the Federation and oversees the day to day operations of the government. The early years of the Federation in the 22nd Century were marred by multiple groups trying to assert their dominance over the whole; however, this was overcome with time as more and more efforts were made to establish a system of collaboration and cooperation amongst the member worlds. Councilors also had to deal with growing risk from external powers that did not want to deal with the nascent government. Early risks came from the Klingon Empire whom saw the growth of the Federation as a threat to their borders. The Romulan Star Empire went into a period of isolation; however, were secretly trying to gain control over key forces before finally being locked behind their borders. The 23rd Century saw the growth of the Federation as a key player in the galaxy as the organization continued to grow. As new memberships grew and territory expanded, the Federation Council was challenged by the growing animosity of the Klingon Empire. This led to the establishment of the Organian Peace Treaty that developed a Neutral Zone between the two powers. This, however, did not preclude small scale conflicts that challenged the Council's resolve. This led to the Babel Conference to welcome additional members into the Federation and negotiate trade deals between multiple powers in the galaxy. The Council would also be drawn more and more into daily galactic politics. Nothing, however, was as damning as the fallout from Project Genesis. To help resolve the issue the Council directly oversaw the trial of the crew of the USS Enterprise for their involvement in the incident and released them from all but one charge due to their efforts to save Earth from the Cetacean crisis. As part of their decree further research into the Genesis technologies. Later, the Council would meet at Khitomer to discuss the disarmament of the Klingon Empire and to establish the Khitomer Accords. The 24th Century would see continued expansion for the Federation, but growing strife. The Federation Council would be forced to set intergalactic limits on Warp technology due to research that discovered that the Warp Drive was damaging the space time continuum. Relations with the Klingon Empire would become strained with the invasion of the Cardassian Union, but would improve again with the outbreak of the Dominion war. Some of the darker methods of the Federation were discovered during the late days of the 24th Century. With the discovery of Section 31 and its efforts against the galaxy, the Federation Council ordered a top level review and had the top leadership of the organization arrested and imprisoned. Nonetheless, several of their actions were applauded including the development of a virus that nearly wiped out the top leadership of the Dominion: the Founders. The Council's actions led to the Andorian Empire temporarily seceding from the Federation; however, they later returned as a full member race. The 25th Century has shown struggle for the galaxy with the outbreak of multiple wars. First, the Federation and the Klingon Empires went to war over the Hromi Cluster and the Archanis Sector; however, peace was restored in 2410. A threat from a race known as the T'Saz Imperium challenged the Council, but the greatest threat to the safety of the Federation itself came with the attack by the Supremacy upon the Federation, Klingons, and Romulans. Divisions were quickly discovered as the varied factions jockeyed for renewed control over the Council itself. Despite this occurring nearly a decade ago, as of 2427 the divisions were still present with some feeling a more defensive tone should be set instead of an exploratory one - especially following the events of Reunification and the death of President Lesia Enaren. It remains to be seen what the future will hold. The Federation Council consists of one elected representatives chosen to represent their people within the Federation government. If, for some reason, a member of the Council cannot be present he/she may appoint a temporary representative from their homeworld or another Federation member to speak on their behalf. At times the Federation Council will opt to create agencies to assist with meeting the organization's goals. Traditionally the Federation President is chosen from amongst the various politicos serving within the Council itself to lead the Federation's government. While each member has been selected to serve the will of the Federation to ensure its continued safety and functioning, the rise of political grouping has led to Political Parties growing stronger within the government with four parties asserting influence. The Authoritatives views are exactly what their name implies. Members of this party have a strong belief in centralizing of executive authority in a powerful galactic government. The Authoritatives publicly profess that they are supporters of stronger law enforcement, a defined structural hierarchy, and greater centralization of executive authority. They support efforts to maximize efficiency in the galaxy by bringing the worlds of the Federation closer together. The Authoritatives are led by Ambassador Rulo of Delta IV. Members of the Constitutionalist Party believe that almost all individual member worlds should retain their own sovereignty in the Federation Council and they strongly support a limited Federation government. Constitutionalists place a general emphasis on greater individual freedoms, both social and economical, and an increased voice for the people. Some of the more radical members of this Party have recommended dissolving the Federation Council and forming a loose collective of worlds rather than a single Federation. The Constitutionalists are led by Ambassador Jocal Tenaras of Xyrillia. Isolationists want to remove the Federation from galactic politics and focus on the internal needs of the Federation and its members. Members of this Party believe that the Federation must stand on its own and to not become contaminated by the influence of outside governments; nor do they want the Federation to continue exploratory programs in interstellar space. They support a strict moratorium on approving new member worlds to join the Federation and want to close the Federation’s borders to outsiders. The Isolationists are led by Ambassador Hreeda Soobu of Mizar. Consisting primarily of former Starfleet personnel, the Militarists feel that the Federation should be focused on enhancing its military presence in the galaxy. Many members of this Party feel that the role of Starfleet has adapted from a defensive and exploratory role to a formal military that should be used to impose the Federation’s ideals upon the galaxy. While some principles of the Federation would still be supported, an increased focus on security is a priority of this group even over the Federation's citizens. The Militarists are led by Ambassador Yox Kortrut of Zakdorn. The Traditionalists are a political party within the Federation that focus on maintaining the customs and traditions of the Federation’s past. This Party believes in expanding the Federation’s role in the galaxy through peace and diplomacy, pursuing exploration of the galaxy, and maintaining Starfleet as a galactic peacekeeping force with a focus on discovery and defense only. The Traditionalists are led by Ambassador Qakke of Phylos. The Palais de la Concorde is a 15 floor office building that serves as the home to the Executive Branch of the United Federation of Planets and is located in Paris, France, on Earth. While most Federation Council sessions are held in the Vanderbilt Building at Starfleet Headquarters, it was decided to include a Council Chamber at the Palais de la Concorde in order to expedite sessions of an emergency nature. The Council Chambers dominate the entire first floor of the complex. Unlike the chamber in the Vanderbilt Building, the complex inside the Palais is rectangular with seating for each of the Federation Councilors along the east and west walls. The northern wall featured seating for the Federation President and a podium for his/her usage when leading Council meetings. Those addressing the Council would speak from the center of the Chamber. The south wall of the chamber featured seating for the public and the press. While the Palais de la Concorde is primarily used for Executive functions the Legislature has been afforded meeting space within the building as needed. Floors four through eleven have been assigned to serve as Embassy space for Federation Member worlds. Throughout these levels are also specialized dining areas that can focus on meals for the variety of visitors to the Council and the electorate. Smaller conference rooms have been established in these areas for various Subcommittee meetings as needed. 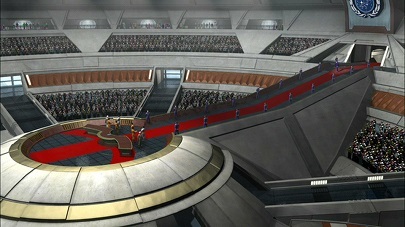 The Federation Council Chamber built into Starfleet One is a perfect replica of the Federation Council Chamber built into the Palais de la Concorde with only one significant change: the Starfleet One facility utilizes extensive holographic equipment to ensure that all Council participants are represented. The Vanderbilt Building in the Starfleet Headquarters Campus in San Francisco, Earth serves as the seat of the formal Federation Council and is used for large scale meetings and ceremonies. The building was dominated by the colossal Council Chamber, a tiered chamber from which the Federation Council conducted business. Divided into eight quadrants separated by ramps, the slopping walls of each quadrant were further divided into an upper and lower level. The lower level of each quadrant contained desks and seating used by delegations from member systems. The upper level of the quadrant maintained a gallery for visitors to observe Council sessions. Each of the ramps converged into a central, circular structure containing a large meeting room that has been utilized by the Federation Charter signatories since the founding of the Federation. Seating at this table is reserved for the delegates from the five original worlds, the President, and two aides. At the start of Council sessions, the section of the office holding the meeting table lifts upward into the Council Chamber. From here the Federation President and the delegates of the founding worlds oversee the Council sessions and deliberations. From atop this platform, Council members may also make use of a small anteroom accessible from the central walkway. The outermost ring of the building houses Embassy space for those delegates whom do not have Embassy space at the Palais de la Concorde. These wedge shaped offices are directly appointed in the style of their species and provide workspace for the Representative to prepare for sessions. Conference rooms were located throughout this ring as well as eateries catering to the diverse needs of the Council and its visitors. Under the Articles of the Federation the Federation Council is a legislative body that is in continuous operation operating on behalf of the United Federation of Planets. Traditionally the Federation Council meets in San Francisco on the grounds of Starfleet Headquarters at the Vanderbilt Building; however, the Council also has a meeting hall at the Palais de la Concorde and onboard Starfleet One. The Federation Council has its own rules of conduct and procedure and serves as the primary legislative branch for the Federation itself. Any Federation citizen has the right to participate in Council discussions, but these citizens are not permitted to vote on matters. The same right is granted to unaffiliated worlds and governments provided that they are affected by decisions made by the Council in its deliberations. The Federation Council may investigate any dispute, or any situation that might lead to conflict, in order to preserve the peace. If necessary the Council can impose that the situation be resolved by the parties, or the Council can choose to intervene. If the situation is directly affecting Federation citizens, territories, or worlds the Council may impose its own solution to a problem or recommendations on how to resolve an issue. Should a threat to peace emerge the Federation Council is required to make every effort to restore peace to the Federation - up to and including armed conflict. In the event of armed conflict the Council will work closely with Starfleet to resolve the situation - often times this included the development of a Military Staff Committee that will oversee the conflict in order to reach an amicable resolution for the Federation and the enemy. Through its mandates of ensuring the peace and stability of the Federation itself, the Federation Council works diligently with Starfleet and all committees to ensure that the Federation's goals are being met. The Federation Council receives routine updates from the Economic and Social Council on available resources and how they are being distributed. Through the same organization the Council monitors the treatment of the citizens of the Federation, ensuring that all citizens are given equal rights. In the event that equality is at risk the Council will work closely with the Federation Supreme Court to remedy the transgression. While the President oversees the Executive Branch of the Federation, the candidate for President screened by the Federation Council before he/she can formally be placed on the ballot. The President then oversees all meetings or may choose to identify a designee known as the President Pro Tempore to head sessions. Traditionally the President may not vote on an issue except for in the event of a tie; however, the President can bring items of discussion to the attention of either legislative body. As part of the responsibilities the President will also appoint staff members - whom are part of the Executive Branch - to work with each legislative body to accomplish the Federation's mission. All members of the Federation's Executive, Judicial, and Legislative Branches are expected to be impartial in matters. To aid in the daily operation of the Federation Council the body has been given the right to establish various subcouncils to fulfill specific needs to ensure legislative oversight. The Federation Economic Council is a standing committee that has jurisdiction over all spending legislation in the Federation Council and monitoring resource utilization. It consists of 16 members. The Federation External Affairs Council is a sub-council of the Federation Council that was designed to lead foreign-policy legislation and debate while overseeing the external relations of the United Federation of Planets. The committee has considered, debated, and reported important treaties and legislation as well as overseeing foreign aid programs. One of the largest Subcouncils, it currently consists of 21 members with one permanent representative from the five founding members of the Federation assigned on a rotating basis. The Federation Intelligence Council was a subcommittee of the Federation Council dedicated to overseeing the Federation's Intelligence Community. The Committee conducts periodic investigations, audits, and inspections of intelligence activities and programs. In addition it prepares legislation authorizing appropriations for the various civilian and military agencies and departments comprising the intelligence community. Membership in the Intelligence Council is temporary and rotated among members of the Federation Council with 15 members sitting on the Intelligence Council at any given time. The Federation Judiciary Council is the 13-member committee of the Council of the United Federation of Planets that has jurisdiction over legal and judicial issues. It is charged with overseeing the administration of justice within the federal courts, administrative agencies and Federation law enforcement entities. It is also in charge of holding hearings and investigating judicial nominations to the Federation Supreme Court. The Judiciary Council is also the committee responsible for impeachments of Federation officials. The Federation Science Council is group of officials of the United Federation of Planets that advise the Federation Council on matters pertaining to scientific aspects within the Federation. The Science Council is a 16 member group that creates legislation on scientific research and policy within the United Federation of Planets. Matters of galactic exploration are overseen by this subcouncil. The Federation Security Council was a committee of the Federation Council designed to deal with matters affecting the security of the United Federation of Planets. The Security Council consists of a 13 member body which had the authority over issues of internal and external Federation security. The Representatives of the five founding Members of the Federation have permanent seating on the Security Council and the remaining eight seats are nominated by the president and confirmed by the Council. As part of its responsibilities the Security Council is capable of appointing special Commissioners to oversee the response to security concerns. One of the first Councils developed, the Federation Social Council has been tasked with legislative oversight regarding measures related to education, labor, health, and the welfare of citizens whom call the Federation home. The largest subcouncil with 31 members, the Federation Constitution places special emphasis on the responsibilities of this group. As such it is one of two subcouncils where the Representatives of the five founding Members of the Federation have permanent seating. The Federation Technology Council is 21 member group of officials of the United Federation of Planets that advise the Federation Council on matters pertaining to technological development and expansion. The Technology Council has jurisdiction over legislation, Congressional action, and other matters relating to technologies developed by the Federation including its member worlds as well as energy. Each Representative of the Federation Council has one vote on matters being discussed. In the event of a tie the Federation President will cast the tiebreaking vote. The Federation Council is based upon the legislatures of both the United Nations and the United States.